Most operators think long and hard about the costs that go into making meals—water for food prep, cooking and washing; electricity and gas for prep, cooking and cooling, and so forth. But how many hotels/restaurants think about the costs of handling the food that we don’t use, or that ends up as waste? If you throw food waste in the garbage, you incur excess tipping fees due to its heavy nature, plus you have the potential problems of foul odours and pests/vermin. Finally, more and more municipalities are limiting the amount of food waste they’ll take in landfills, if not banning it outright due to the formation of methane, a greenhouse gas far worse than CO2 unless collected and reused. It’s clear that these trends will affect almost all operators eventually, not just volume feeders producing a lot of organic waste. The question is no longer whether you’ll have to change how you handle food waste, but when. 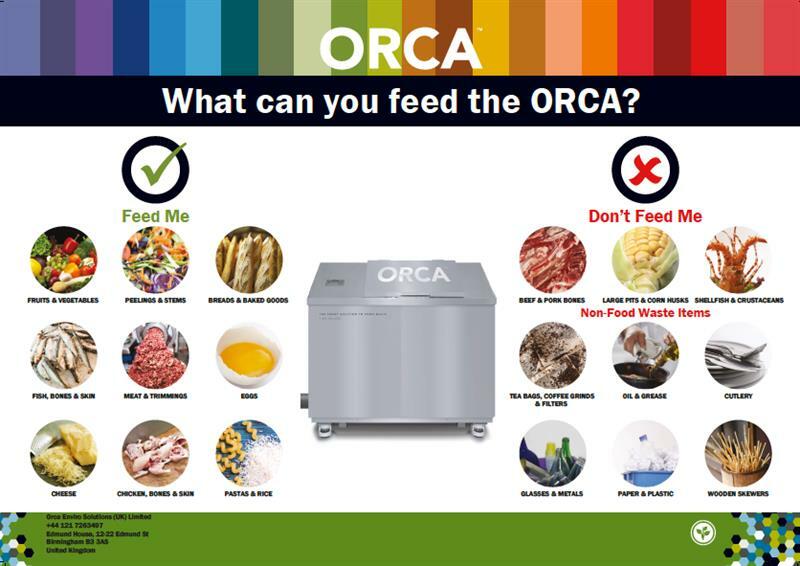 The ORCA organic food processing system offers a sustainable food waste disposal solution that allows customers to dispose of organics at the source. The ORCA uses an aerobic digestion process that converts food waste into an effluent safe for discharge into the municipal wastewater system where high-value renewable fuels and natural fertilizers can be economically produced and recovered. The unit accelerates the breakdown of food waste through a combination of proprietary microorganism solution and Bio Chips, oxygen and water. The ORCA is service based with no capital outlay & provides a fixed cost solution for Organic Waste.